It’s time to start another tradition. Today marks the end of the first full year of The Golf Column. Let’s review some of the highlights of a very active time in Cape Region golf. 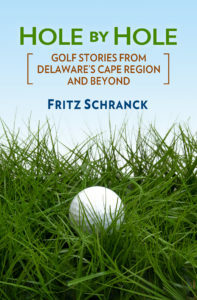 January—The golf column starts in The Cape Gazette. The Pulitzer Prize Committee is notified, but it fails to respond to my letters, e-mails, and telegrams. Also in January, new USGA handicapping rules go into effect for golfers with handicaps of 9 or below. The 35 golfers in Sussex County affected by the change applaud it. February—J.P. DuMortier’s new golf business is featured. The club maker and retired school superintendent says, “This is the thing that I always wanted to do.” Golf column readers also learn in another column that “getting in shape for golf” is not a contradiction in terms. March—The column devotes a piece to Cyclonic Golf, the new golf shoe company headquartered in the Cape Region. After the article is published, the company’s business really takes off. There is no real connection between these two statements. In March the column also runs the first segment covering the Cape Henlopen High School golf team. Co-head coaches Jerry Dorneman and Steve Wolak discover the fun of dealing with my deadline pressure. April—Rehoboth Golf Park prepares to open its new Creekside course. It’s the first new Cape Region layout since Baywood Greens. Later in the year the Marsh Island course near Angola also begins play. Rising to the competition, Old Landing Golf Course shows off its new renovations. Also in April, charity golf tournaments go into full swing, generating thousands of dollars for good causes. May—The golf column does more charity tournament stories, especially the May 7 Pink Ribbon Classic for breast cancer detection and assistance, and the Meals on Wheels tournament on May 10. Coverage of the successful Cape golf team continues, including their season highlight, a second place finish in the Henlopen Conference tournament. June—Cape’s golf team finishes seventh in the tough state golf tournament. PGA TOUR pro Mark O’Meara also wows the Cape Region with his appearance June 25 at Rehoboth Country Club, benefiting junior golf. July—Marking the new interest in the Cape Region as a golf destination, the column profiles Delmarva Golf-a-ways and Sea Dogs. The new companies offer tee-time reservations and package deals with the local hotel industry. Readers also begin reading the saga of playing in the Oldsmobile Scramble Tournament, with local tournament coverage. August—The column starts a series on the construction of The Rookery, the new public course being built outside Milton. Readers also try their luck at a new golf knowledge contest. Oldsmobile tournament coverage continues, with two Cape Region teams qualifying for the national finals at Disney World. September—Bernard McMartin wins the golf knowledge contest with a near-perfect score. Thousands of readers vow to try harder next year. October/November—Local golfers learn about the Leaf Rule, as well as the danger in assuming that a bare tree is 90% air. The column also describes the Heritage Inn & Golf Club as it nears completion for a spring 2000 opening. December—Cape Region golf course superintendents detail their renovation work progress and plans over the late fall and winter. Readers also obtain a golf book buying guide, a plan of action for last minute Christmas golf gifts at local pro shops and stores, and a series of Christmas carols for golfers. I’m looking forward to another fun year in Cape Region golf. Have a Happy New Year!